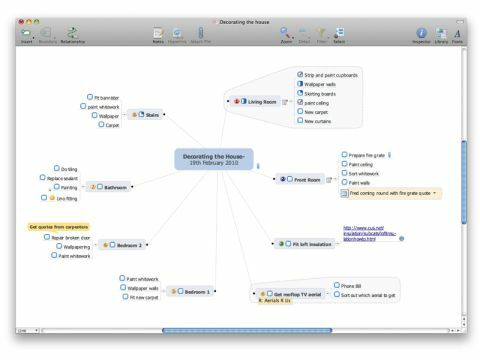 A mind map is a graphical way of making notes, and MindManager 8 is a piece of software to help you with this process. By visually organising your information, you can collect your thoughts and ideas around a central theme. Individual elements can be mapped as separate branches within your overall plan, further leading into minor details and specifics. Information is readily accessible without becoming overwhelming, the relationship between individual concepts is clear and you can pay attention to the minutiae without losing track of the big picture. Progress can be recorded too, with milestones set and completed. Mindjet MindManager 8 is one of the biggest mind-mapping tools on the Mac. It's surprisingly easy to use. Pre-designed templates are available for planning events, conferences, meetings, SWOT analyses (that's Strengths, Weaknesses, Opportunities and Threats), to-do lists, travel plans and more. Naturally, you can start with a blank map instead if you wish. You can save your mind maps as templates too. A very useful feature lets you link images, URLs, notes or documents with specific points on your mind map. For example, if you're planning a holiday, an entry about outward travel could be linked to a list of service stations on your planned route; a branch about day trips could offer bus timetables or web pages covering your intended destinations, and there's a collapsible side panel for your notes. It's certainly more comprehensive than ConceptDraw MINDMAP's linking tool. If it all gets a bit unwieldy and overwhelming, you can hide specific branches, collapse and expand sub-topics and filter your map to hide and reveal specific items. With this eighth release, the Mac version of MindManager is no longer the Windows application's poor relation. Launched over a year later than its PC counterpart, the extra time in development has clearly been put to good use. A great deal of effort has been put into integrating it with OS X's native applications, as well as iWork and Microsoft Office. Yet this integration is a mixed bag. While calendar events can be added quickly and easily – accessed through the map entry with which they're associated – Address Book integration is clumsy and awkward. Attaching addresses to your mind map is far from instinctive, and while it's useful for sharing your addresses as vCards with those who share your map, checking addresses is a chore. One feature from the Windows version that's still lacking in the Mac app is the facility to export a specific branch to its own separate mind map, while retaining its links with the parent document. On a PC, it's as easy as right-clicking and selecting an option, but on the Mac, this feature is nowhere to be found. This seems a bizarre omission considering how much attention has been paid to the Mac app's feature set, even to the point of supporting Gestures for when you're using it on a MacBook and sharing maps via iChat during real-time conversations. The casual user may prefer the more visually striking, very Mac-like and significantly cheaper OmniGraffle 5, but for the more demanding mindmapper, MindManager 8's integration with OS X applications, high degree of configurability and comprehensive linking tools win through.